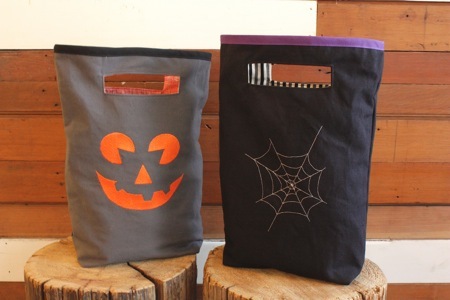 Celebrate the spookiest day of the year by crafting a one-of-a-kind reversible Trick or Treat bag that your family can carry year after year! 1/2 yd of canvas (or outer fabric). 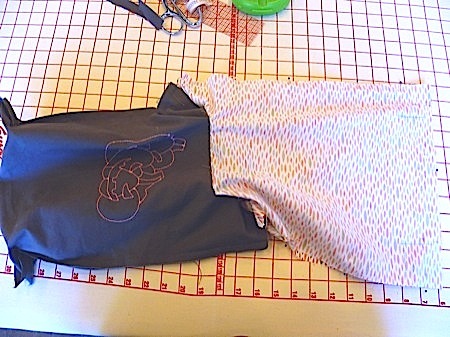 If using lighter weight fabric, I would back it with a mid-weight fusible interfacing to provide some heft. method for embellishing. Machine embroidery, hand embroidery, fabric markers, & applique would all be awesome! I started with a rectangle, 12″ x 16″. I like to make a physical pattern piece so making more is easier. 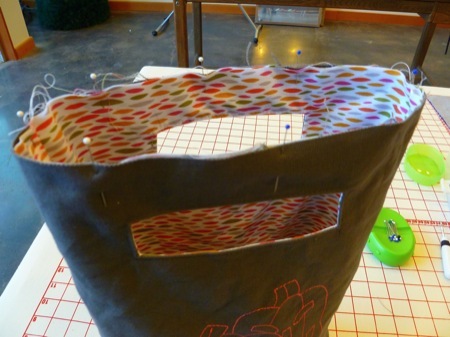 This measurement includes the 1/2″ seam allowance for 3 sides, two long and one short. At the other short end we will mark the placement of our handle. 1.5″ down from the top edge, centered, 4.5″ wide and 1″ long. At this point, I went ahead and marked the boxes for my corners. From each corner edge, mark a box 2.25″ tall and wide. I also went ahead and marked my seam allowances lines. Your pattern piece should look like this. 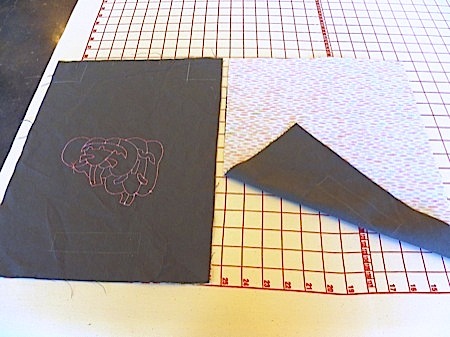 You’ll cut two pieces of the exterior and lining (if interfacing, cut two of those now and fuse to the wrong side of both exteriors). On the wrong side of all pieces, transfer your handle and box corner marks. 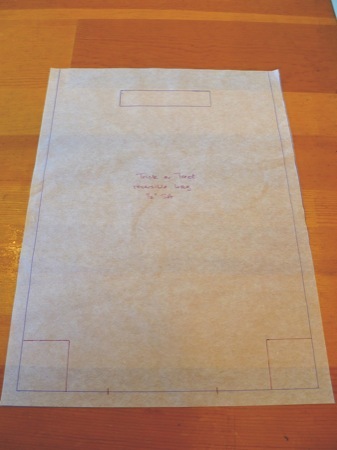 I used a tracing wheel and tracing paper, like the ones mentioned here. I can’t stop myself from purchasing embroidery designs and Halloween-themed ones have proven no exception. The designs you see featured in this tutorial come from several places–Urban Threads, Embroidery Library, and Embroidery Designs. 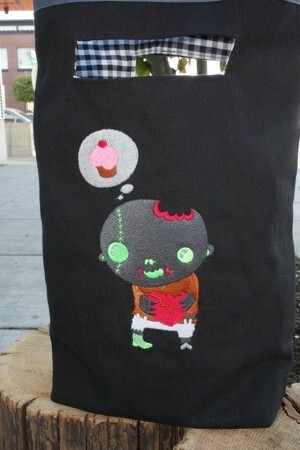 I’m always looking to thoughtfully place embroidery and these Trick or Treat bags were a no-brainer. Plus, I totally needed to play more on the new BERNINA 580. If you don’t have access to an embroidery machine, you can hand embroider a sweet and simple ghost or spiderweb. Maybe that even seems like too much? Get a light colored canvas and fabric markers and let your little one draw an image. Or try applique. Or simply use two spooky fabrics. Have fun with this part…you know I did! Once the front has been embellished (or not), you’ll start by laying one exterior and one lining piece right sides together. 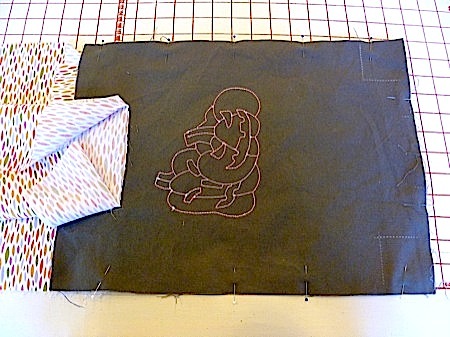 Sew the rectangle of the handle marks. 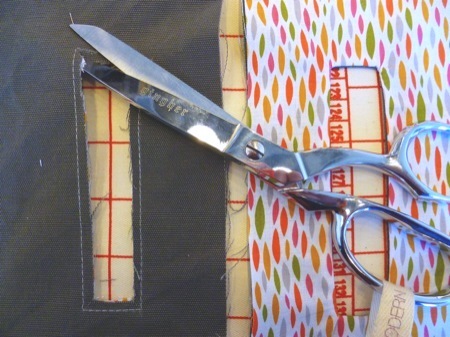 Cut out inside of the rectangle and clip at an angle into each corner, making sure not to clip through your stitches. Turn right side out through cut opening, pulling gently to create crisp corners, and press. Repeat for second exterior and lining piece. Topstitch around the handle opening. I used a different color for my bobbin so it would blend with my lining fabric. 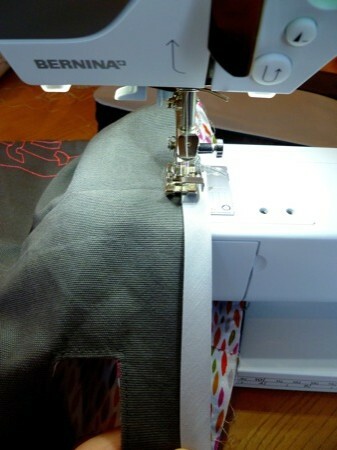 The BERNINA #10 Edgestitch foot is especially useful for this task, or just be mindful to keep a consistent distance from the edge. Your pieces are now joined at the handle. 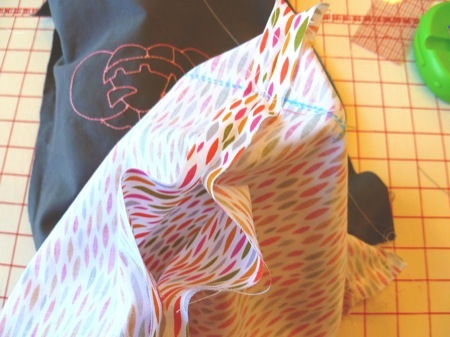 Lay them exterior right sides together, being careful to not catch the lining, and stitch around the long sides and the short bottom, 1/2″ seam allowance. 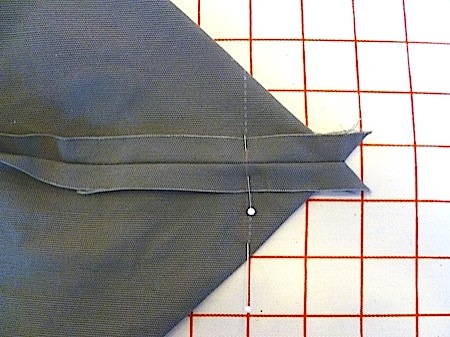 To box out your bottom corners, create a triangle with bottom and side seams lining up. 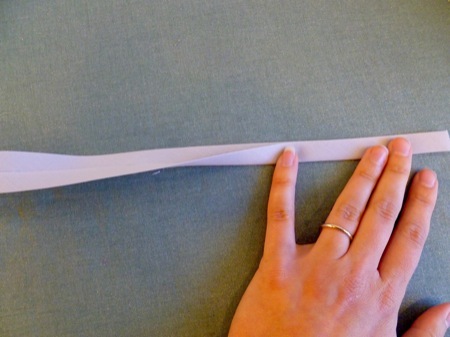 The corners of your box will be at a fold and will create a line straight across, approx 3.5″ long. Stitch, making sure to backstitch at beginning and end. Repeat for other corner. Open the lining so it can lay right sides together. At the top corners, this will require extra manipulation. Work slowly making sure not to catch the exterior. 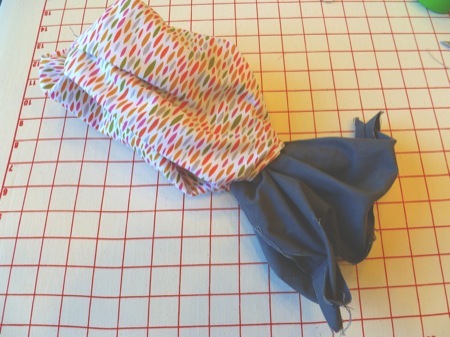 Stitch both long sides and short bottom side, 1/2″ seam allowance. 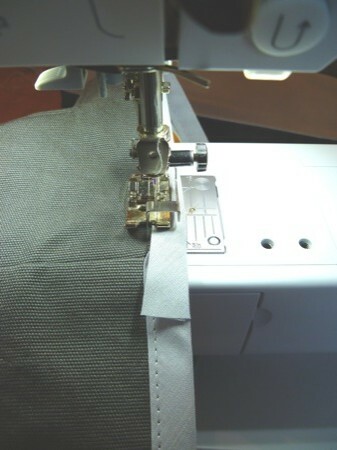 ON THE BOTTOM SEAM, YOU WILL NEED TO ALLOW AN APPROX 4″ OPENING IN THE SEAM. This is for turning the bag right side out. 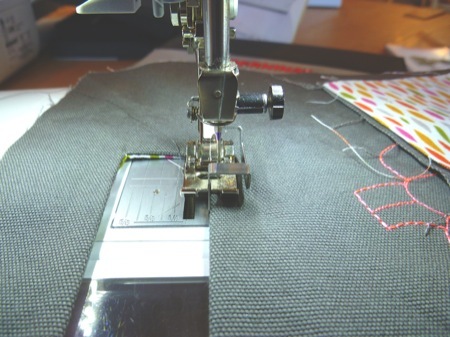 Stop seaming in the middle of the bottom seam, backstitch, and clip threads then restart seam 4″ away, backstitch and continue around the corner. Box these corners as you did for the exterior. Turn right side out through the opening left in the bottom seam of the lining. 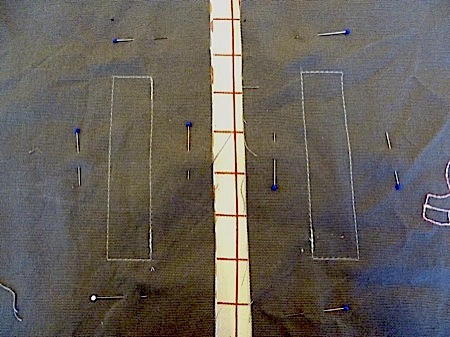 While the lining is still out, edgestitch or hand sew the opening closed. Flip the bag so the exterior is on the outside. The top edge is still raw but all other seams are hidden. Press the seam allowances near the top edge open for both exterior and lining. Baste the top edge of the exterior and lining together. I took my 1″ single fold bias to the iron, folded it in half, and pressed to create a double fold. Encase top raw edge with bias tape and topstitch. 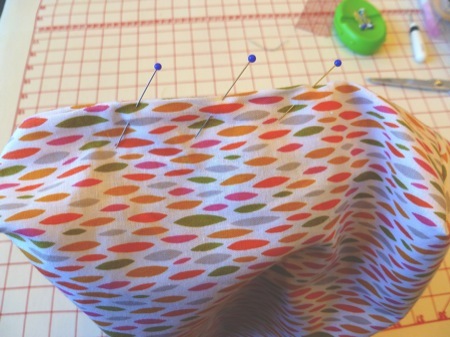 You will want to ensure the stitch catches the underside of the bias tape. I tend not use too many pins here, but feel free to. At the end, I simply overlapped the raw edges, trimmed if necessary, and backstitched. Hand off to your little Trick or Treater! Happy Halloween! well, now….this is just ridiculous. this post makes me really really want the 580 again 🙂 a super fun tutorial! really cute. Can make some for any occasion. 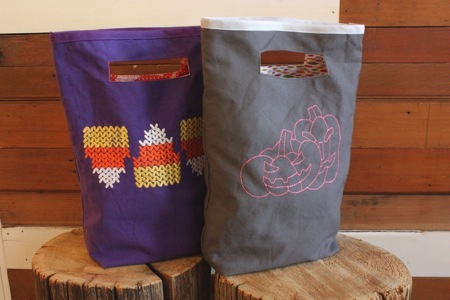 Oh this makes me so happy – and cross-stitch candy corn!?! YES! Thanks so much. Great tutorial! I will definitely be trying this! I might make one to carry all year-round (or as a small project bag). I also wanted to say that I had a great time chatting up Meredith on Sunday when I stopped by to pick up a walking foot. I even blogged a bit about it. 😉 Thanks and cheers! Creative!! Good job! It looks good. It’s awesome… nice info shared..
Hi! Great tutorial, thank you so much for posting this! I’ve had a few requests for these, but I’m not sure what to charge. What would you charge? I’m always very resonable on my prices. Charging for sewing can be challenging. I would charge what you feel comfortable with. There is no right or wrong answer! Thanks! I might be having a blonde moment here but I don’t understand the handle part. Are you supposed to leave a hole in the rectangle to flip it out? lol I got it now!